Moscow and Washington can still find ways to cooperate on several global issues, but the U.S. needs be the initiator of future talks. Although the "reset" in U.S.-Russian relations has been sapped dry, Moscow and Washington can still find ways to cooperate on combating global terrorism, arms control and the resolution of regional conflicts. The time has come to set the agenda for such talks. Considering, however, how deeply President Vladimir Putin has taken offence with Washington over the U.S. Magnitsky Act, it would be unrealistic to expect constructive proposals from Russia anytime soon. That means the initiative should come from the U.S. side. The U.S. should take the first step because Russia is not an enemy or even a threat. Russia wants to build a global financial centre in Moscow, but it turns out that even tiny Cyprus is more of a financial centre for Russian businesses and depositors than Moscow. Russia believes that it will supply Europe with oil and gas forever, but the first wave of European Union states will largely switch to buying shale oil and gas from the U.S. or switch to renewable and alternative sources of energy by 2025. First, it would be pointless to pursue a political dialogue with Russia based solely on the old, worn-out issues of arms control and human rights. The emphasis should be shifted from politics to the economy, and Washington should be prepared to offer Russia substantial economic incentives in return for political concessions. If U.S. President Barack Obama wants Moscow to agree to major bilateral cuts in nuclear arsenals, he should promise a sharp increase in U.S. investment in Russia, cooperation on advanced technologies and willingness to sell U.S. assets to Russian companies that are interested in them, even if those companies are partially owned by the state. Washington should take the lead in engaging Russia with economic and investment initiatives to aid the development of both countries. For example, this could include a free trade zone like the one Moscow is currently negotiating with the EU and Japan. Russia is not a competitor to the United States. It is more likely an additional market for its goods and services. Washington can best achieve its military and political agenda with Russia by offering economic cooperation on any scale Moscow desires. This would be advantageous to both sides. Second, it is fruitless to continue emphasizing human rights and other sore spots with Moscow. It would be much more productive to focus instead on general issues concerning the new world order. Russia wants its voice to be heard on the global arena. Why couldn't the U.S. work with Russia to formulate principles governing, for example, humanitarian intervention or limited sovereignty? Why not actively involve Russia in a dialogue on issues of global governance? Working together, they could define a new world for the 21st century in which the U.S., Russia and Europe would team up to retain their leadership positions in the face of rising threats from global terrorism, rogue states and competing centres of power. Third, the U.S. has de facto disengaged from Europe politically and militarily, and it has yet to establish strong economic ties with Russia. That means Moscow and Washington should look for a new area of cooperation. One good place to start would be the Pacific Rim. Alaska, which borders Russia, currently does more trade with Ukraine than with Russia. Just like Washington, Moscow would also like to "pivot" to the East. But in addition to China, that East should also include Japan, South Korea and, strangely enough, the United States. The U.S. and Russia could even create an alliance called the "North Pacific Treaty Organization." It sounds like a joke, but for Russia the East includes countries that for many years were part of the West. 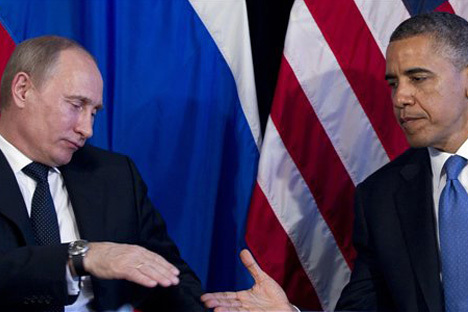 With this pivot to the East, the U.S. should become Russia's best "Eastern" ally. Twenty-five years ago, the Soviet Union initiated perestroika and glasnost, a reform program that the U.S. supported wholeheartedly. But even after the Soviet collapse, the full potential of that bilateral cooperation was not realized because the U.S. side did not treat Moscow as an equal partner, particularly during the 1990s. Now that Russia has recovered from the chaos, instability and poverty of the 1990s, the U.S. must take the lead in U.S.-Russian relations. Washington should start by speaking with Moscow on equal terms and with respect. The measure of wisdom for a great power like the U.S. is its ability to treat large, influential partners like Russia as equals. That approach has always been very effective in global diplomacy and international relations. The alternative — acting like a global gendarme — is not only ineffective, but it is also dangerous and destructive to global security. Vladislav Inozemtsev is director of the Moscow-based Centre for Post-Industrial Studies.